If you are a UFC light heavyweight fighter complaining about the recently announced Jon Jones vs. Chael Sonnen fight… talk to the hand. The hand of UFC president Dana White, that is. While many people, fighters and fans alike, have been perplexed at the UFC’s decision to slot in Jones and Sonnen as coaches for the next season of The Ultimate Fighter and then have Sonnen fight for the title in April of 2013, White has a simple explanation. “We got the word, after Jon went out and got his elbow checked, that he was out and couldn't fight until April,” explained White on Wednesday. “So it made sense for him to do The Ultimate Fighter. Machida can fight, Dan Henderson can fight; Gustafsson and Shogun are gonna fight in December, so everything will keep right on moving (in the division). 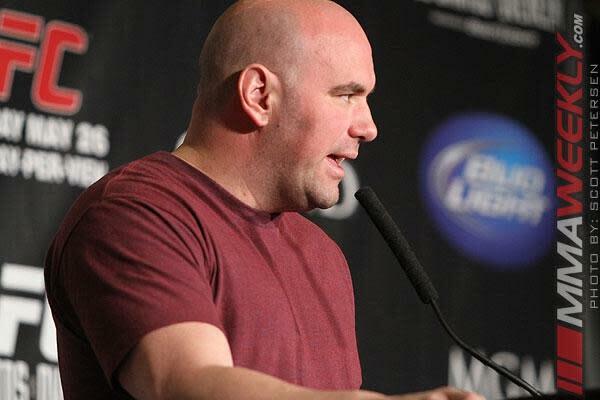 “Obviously Chael wants this fight, has been asking for this fight. The fans wanted this fight. Still, many are going to point to the fact that Chael Sonnen has not fought at 205 pounds in the past half decade, is not a contender in the division, and should not be able to “talk his way” into a title shot. Again, White would point to the timing, and the fact that several other fighters had their opportunity and when the UFC needed someone to step up, Sonnen was the man to answer the call. “I've said this before and I'll say it again, Dan Henderson had the opportunity for the fight and he got injured, right? He got injured, now Jones is injured until friggin' April,” said White. For White, the equation is quite simple. The best time to make hay is when the sun shines. Stay tuned to MMAWeekly.com for all of your UFC news and updates.